When I was planning my Vietnam trip, Hoi An was the place I was looking forward to most. Everyone that had ever been to Vietnam had said it was their favourite city and I couldn’t wait to walk around the dreamy, lantern filled streets. Sadly, I didn’t account for the typhoon that hit central Vietnam while I was there, which meant I had to go straight from North to South of the country. A week later I heard Hoi An had cleared up and although it meant going completely out of my way, flying from Ho Chi Minh to Hoi An, so that I could then fly back to Ho Chi Minh to go to Cambodia a week later, I decided that I couldn’t miss it. It’s sunset when I eventually arrive in Hoi An and the sky is a beautiful shade of pink. When I get to the waterfront Hoi An takes my breath away. Lanterns everywhere light up this little city. Their colours reflect in the river that runs through this Unesco world heritage site and in the background someone’s playing the guitar. I feel like I’ve walked straight onto a movie set. On the river are little long tail boats taking people down the water, on which little coloured lanterns lit by candle are floating. In the centre street vendors are selling sweet banana crepes at the night market and high-end restaurants and low-key bars are filling up with people. Hoi An’s old town is a Unesco world heritage site. It’s free to explore but if you want to visit the museums and five ancient houses then you need to buy an entrance ticket costing 120,000 VND. There’s nothing that symbolises Hoi An better than Lanterns. originally the locals, started to hang them as they believed that they bring happiness, health and good luck if they have them outside of the house. Now lanterns have become an iconic landmark for tourists and the crowds pile into the night market every evening to take photos and to watch them being hand-made. Even the bigger ones fold up pretty compactly, making them easy to transport back home. Or fancy trying your hand at making your own? Try one of the many popular lantern making classes. 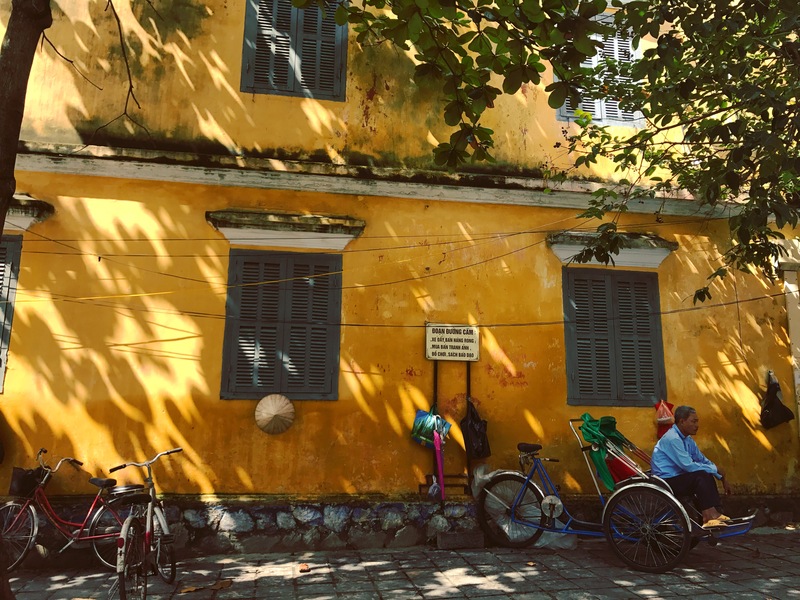 One of the best things to do in Hoi An is people watch, and there’s no shortage of places to do that from. The centre of the city is car free meaning it’s the easiest of places to wander around. Hoi An boasts many museums that paint an interesting depiction of life in the city, back in the past. As well as being fascinating in themselves, most of these museums offer great views over the city streets from their balcony’s and windows. Although distinctively Vietnamese, Hoi An’s strong foreign influence can be easily spotted throughout the city. If visiting the city it’s impossible to miss the beautiful and ornate Japanese covered bridge as well as it’s many Chinese temples such as Cam Pho and Quan Cong. Hoi An’s location in Vietnam and it’s proximity to the river mean that it’s prone to flooding. However the water clears up pretty quickly when this happens. Hoi An was flood free when I visited until the day that I left. I got down to near the waterfront and couldn’t understand why everything suddenly felt different and I felt complete lost with where abouts I was. When I walked down a little, I realised what had been one of the central streets was now the waterfront and the front two streets had been engulfed by water. The locals are pretty resilient when it comes to dealing with this, and boats take the places of bicycle’s on the streets. Still, the economic cost of loss of trade can be massive for the cafes and restaurants on the river front. Hoi An has countless places to eat, from fancy restaurants and wine bars, to cheap dishes at The Central Market and snacks from street vendors. More than anything, Hoi An is a place to satisfy your sweet tooth. Spending some time in one of the many cafes and dessert eateries and bakeries is a must do. Make sure to try the vegan coconut milk coffee at one of the Hoi An Roastery cafes and a raw pressed juice at Cocobox when you need to detox from the sugar. The ‘Watermelon Men’ one is so refreshing. You also have to visit the Cargo Club to try their infamous desserts. The mango cheesecake is insane. It goes without saying that visiting Vietnam without trying a banana crepe topped with condensed milk at the night market is a crime. They make the perfect post cocktail snack. Hoi An fun fact number one: There are over 100,000 bicycles on the roads in the city. So although you don’t need to watch out for cars in the old town, take care not to get run over by bicycles while snapping your pics. If you’ve got the time then why not take one of the boat rides down the river once the sun goes down? There’s plenty of people offering these and they won’t set you back much money for a half an hour or so. If you walk around Hoi An at night, you may see local people burning fires outside of their houses. Many families burn ghost money made from paper and other paper items in vats, believing that it will pass to deceased relatives and be deposited for themselves in the afterlife. In Hoi An this act has a romantic and dreamy connotation to it. Hoi An’s Central Market is the best place to grab something to eat, with most meals costing just 30,000 VND. The local specialities that you must try are; Cao Lau, chewy noodles in a flavoursome sauce, usually served with pork and fresh greens and White Rose shrimp dumplings which are delicate, light and flavoursome. You also can’t visit Vietnam without trying a Banh Mi, and Hoi An is the perfect place to have one. A tribute to Vietnam’s French influence, these soft baguettes are sliced open and filled with delicious fillings like pork or pate, and then topped with fresh herbs, veg and sauces. They can be picked up from a street vendor at any hour of the day. Opinions are divided between where the best Banh Mi is: Banh Mi Phuong or Madam Khanh. So I guess you just have to try both. Hoi An translates as ‘peaceful meeting place’ and it’s fair to say that it would be hard to come to the city and feel stressed. If you’re feeling inspired to visit, (how can you not? ), then the best way to get there is by flight into Danang city airport and then by bus or taxi from the airport to Hoi An’s centre. The journey takes around 40 minutes. Wondering where to go next? Head North to the imperial city of Hue or South to the beaches of Nha Trang.